← Even the ground is a work of art . . . .
Cupid invites you to Rome. Cupid wrestles a fish while the nymph beyond turns away from us. 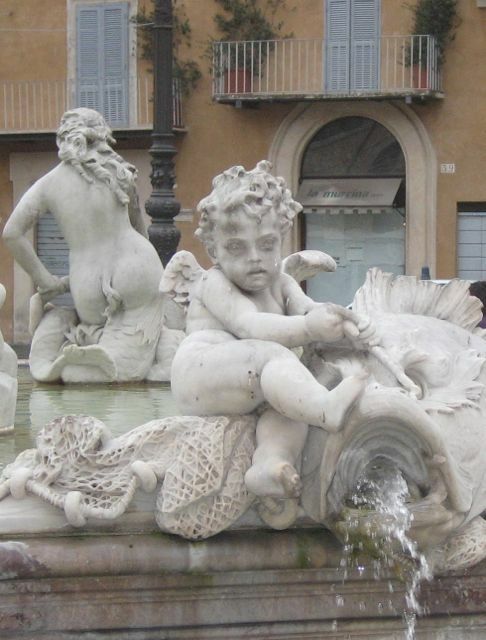 Cupid invites you to Rome. Statues in one of the many fountains of Rome, frozen in time and mid-movement, their hair tossed – turn as if to greet us. Take a day or two to experience the Eternal City before we pick you up at the Central Train Station and transport you to The Quiet Garden retreat. From our villa, one hour north of Rome, we will have seven days and nights to rejoice in the beauties of Italian Renaissance gardens and create our own beauty through art meditation. We will experience the ‘garden-magic’ that Edith Wharton described in her 1904 book, Italian Villas and Their Gardens. She visited the gardens in a February and we will be in many of the same gardens 111 years after the book was published.